Niagara Falls Tours – US President Barack Obama has requested more than $60bn (£37bn) from Congress for response, recovery and repairs in the wake of “Superstorm” Sandy. The scale of the request was welcomed by the governors of the two worst-hit states, New York and New Jersey. But the request fell short of the $80bn estimate of the total damage done in those states and in Connecticut. The White House said the storm was on track to be the second or third most costly storm in US history. Only Hurricane Katrina in 2005 and Hurricane Andrew in 1992 caused more damage, Jeffrey Zients of the Office of Management and Budget (OMB) wrote in a letter to House Speaker John Boehner. 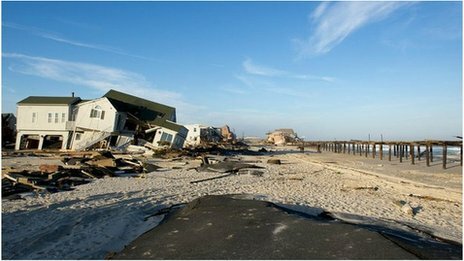 Sandy has been blamed for more than 120 deaths, and many thousands of people are still unable to live in their flood-damaged homes. The presidential request will have to pass the Republican-controlled House of Representatives and the Democratic-led Senate before funds are made available. It is expected to face scrutiny in Congress, where many fiscal conservatives are strongly opposed to increases in US federal spending. Mr Obama’s team proposed no spending cuts in conjunction with the funding request, saying the “sudden, urgent, unforeseen and temporary” nature of the disaster made the request allowable under disaster-relief laws. In a statement, Governors Andrew Cuomo of New York and Chris Christie of New Jersey thanked Mr Obama for his “steadfast commitment of support” since the storm hit on 29 October. They said the package would pay for “essential mitigation and prevention efforts that will better protect our region against the devastating impacts of future superstorms”. The huge funding request comes as the president and his advisers are negotiating with Republicans over a deal to avoid the so-called “fiscal cliff” – a combination of spending rises and tax cuts due to take effect on 1 January if no action is taken. In the House, one leading Republican committee chairman agreed that Congress bore a responsiblity to fund disaster relief for those affected by the storm. Away from Washington, fundraising efforts big and small are continuing in the north-east in aid of relief work. In New York, organisers of a huge relief concert due to be held at Madison Square Garden on 12 December – called 12.12.12 – announced that the Rolling Stones would join an already glittering line-up. The Stones, currently on a 50th anniversary tour, will join Paul McCartney, Bruce Springsteen, Kanye West, Bon Jovi, Billy Joel and The Who at the event.